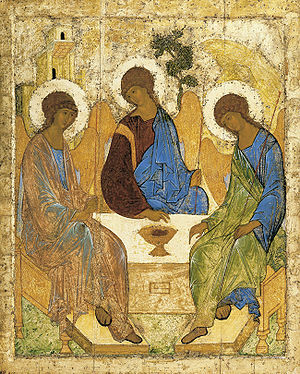 One of the most profound interpretations of the feast we celebrate today is Rublev’s Trinity. It’s a 15th Century Russian icon that is probably one of the most known. At face value it actually is a story that we don’t hear today but did at some point this past year, of three visitors, or angels, that visit Abraham and Sarah who are about to turn their lives upside down when they are told they will give birth to Isaac. Rublev has these three images that all look alike and yet dressed differently sitting around a table or altar. Now I’m not sure if it was intentional or not, but there is a similar scene in the movie version of The Shack when the father is at wits end and finds himself gathered at the table with the three persons of God. It is believed that that was Rublev’s intention that the fourth one to gather at table was you and me, humanity. The more you find yourself invited at table the more you participate in this force of love, union, and oneness, and you become that mystery. One such person that certainly exemplifies that is Moses who we hear from in the first reading from Deuteronomy. Moses often found himself being drawn back to that table to gaze into the eyes of God that he becomes one of the great figures of salvation history. He’s well aware that others are not in the same place as him on this journey, as they still wander seeking their own gods, but he’s there to remind them of what he has experienced in that participation with mystery and how it is transforming his own life. He recalls for Israel today their own history as a people and the many times they have not only wandered, but how the true God of mystery, unfolding within and among them, has seen them through some of their most difficult challenges as a people. He takes them back to the beginning reminding them of their own creation as a people and they have been created in that image and likeness of God. Now Moses doesn’t keep returning to the mountain to convince God that God is someone else or give to give God pointers on what needs to be done and what the people want, rather he returns to that place to soak in that mystery and allow it to consume his life to his deepest core, a core that is that image and likeness. Like Israel, where we fail and find ourselves wandering is when we want to create God in our own image and likeness rather than allowing ourselves to be transformed by the unfolding mystery. It’s the mastery of Rublev’s icon because you can’t take your eyes off of it as you gaze at it’s beauty and mystery, drawing you more and more into the mystery of God and the mystery of our own lives. Without mystery, life becomes dull as do our relationships. It is, as well, the pinnacle to Paul’s message to the Romans in today’s second reading on becoming the adopted children of God. Paul is fully aware that people wander. He himself has wandered in his own life, seeking that sense of meaning from something beyond the divine indwelling. His view for the Romans comes from the masters who have had their own experience and literally adopt one of their slaves as their own. This experience at table with mystery has a way of breaking down the many barriers that we create for ourselves, separating ourselves, one from another, as was true in a master-slave model. Paul, though, like Moses, continues to take them back to the beginning and remind them of who they have always been as children of God, born in that image and likeness. Like Moses, the more he gazes and the more we gather at table with that mystery that unfolds and in its almost seductive manner, transforms without us evening knowing and grow into that image and likeness. We become living icons, where we’re not God, but our lives simply point to the mystery that has drawn us in and have fallen in love with while participating in that love and that mystery. As we celebrate this great feast, we gather in the name of that one God who invites us to Rublev’s table and to participate in their radical hospitality of drawing us into love, mystery, and union. We will never completely understand any of this and shouldn’t think we can. We will never completely know it because it is beyond knowledge as we know it. Rather, it is a knowing that lies deep within, where heart speaks to heart, often being dragged in like the guy in The Shack, finally moving to a place of surrender. It takes utter faith and trust on our part, a dark night as it’s known, to trust in such a way. When we allow ourselves to be used that way, by mystery and love, we become transformed in such a way that we are the living icons for a world that has enough of its own gods, we simply point to the one true God. This is a God that keeps expanding our hearts and that very table for it is only in love that we have space for all, no matter, color, where we’re from, background, lifestyle, the many who have wandered far from “home”. The mastery of Rublev’s Trinity is that there is space for everyone, knowing like Abraham and Sarah, when we finally surrender to mystery, our lives may be turned upside down, but better that than anything else. We pray for the grace to become these living icons in the world today, where all we do and say points to love, to mystery, to union and oneness, to the one true God who continues to unfold that very mystery in the world today. Despite the passage of centuries, I do believe that to this day Moses, people Israel, and the whole experience of the exodus and exile has something to teach us about our own lives. Their story really is our story. We know what it feels like to live in exile from others at times, even from God. It so often seems, in such contentious times with Moses and the people, that they lose their ability to relate to one another and to God and move towards cutting themselves off, moving into this tribal mentality of winners and losers, where, in the end, everyone ends up losing. The same is true for ourselves and the climate in which we live these days. On many levels we’ve lost the ability to relate to anyone different than ourselves and have really exiled ourselves from one another or at least from people that we have deemed the losers, the ones that think differently, creating this divide, and like people Israel, we have become stuck. We can’t relate to others and then for that matter, with God. Think about their experience, though, in relation to ourselves. Despite this newfound freedom that people Israel experiences following the exodus, they don’t know quite what to do with themselves. It’s as if they had become accustomed to being slaves in Israel that they no longer know how to live. They don’t understand what’s up with Moses and his seemingly strange experiences, but they also don’t understand God. Keep in mind that this experience has impacted them on a very deep level. They had gotten used to a God that seemed to abandon them. They had gotten used to a God that seemed to reject them over and over again, and now as they move to this place of freedom, they don’t know how to act and they certainly don’t know how to relate. They react to it all and create these false gods for themselves, grouping themselves and finding, at times, a common enemy in Moses for leading them to this place. It’s simply their experience but so is being stuck as they seem to become in the throws of the desert for years to come. As Moses tries to lead them to a deeper understanding of this God, a God of mercy and generosity, their hearts remain closed and they become, as he so often refers, the stiff-necked people. As life changes so does the way we relate to others and especially to God. This is what we encounter in this snippet we hear from John’s Gospel today. In its larger context is an interaction with one of the more interesting characters in the gospel, Nicodemus who’s known for coming to Jesus at night. At this point in John’s community, some fifty years after their formed, there is a great deal of contention and division. We have certainly heard that during the Lenten and Easter seasons as Jesus often found himself in conflict with the leaders. Well, Nicodemus was one of them. He has his own way of relating in the life of the community as a Pharisee and is not yet willing to put that in jeopardy so he comes to Jesus at night. As much as people Israel didn’t know what to make of a God that wanted to enter into relationship with them, even centuries later they still can’t quite grasp now this God who takes the form of one of them in Jesus. It causes more tribal thinking, certainly among the Pharisees who had their own way and were stuck in that thinking. For them there had to be winners and losers. For Nicodemus, despite being one of them, he finds himself somewhat attracted to this Jesus guy and what he’s all about. For John it is a process we go through, of letting go and reconciling, allowing ourselves to move forward in life with a fresh take on the way we relate to one another and to God, not in some distant universe, but right here in the midst of our own lives as they unfold. In the end, it’s probably Paul that sums it up best for us in today’s second reading and provides us the tool to look at our own lives and the way we relate. Just because we’ve related in one way all our lives doesn’t mean that it’s the best way or even the healthiest way. Again, we see that on the large scale in our political system and the divides, people moving to the extremes. Paul reminds us to mend our ways. Reconcile with one another. Love stands as the foundation of relationship and community. Work towards peace. Among other tidbits of ideas that he shares with us today. If we continue to cling to a God that rejects, abandons, or shames us, it’s just probably not God. There’s a better chance that we can relate to people Israel and find ourselves stuck in life, just as we find ourselves politically. It impacts all of us and the way we relate. On this feast of the Most Holy Trinity, maybe it’s time accept the invitation to be the fourth one at the table and being challenged to change the way we relate. If we cling to tribal thinking, where we’re right and others are wrong, where truth becomes relative, where there needs to be winners and losers, well, guess what, we all lose and we are all losing because we’re being invited to move beyond our stuck-ness and grow into a deeper relationship that goes beyond ideology and politics, to the deeper reality of a God that continues to pursue a relationship with us from deep within our very being and through all creation we encounter. Where are we stuck in our own thinking and understanding not only of others but of God? That’s the place this God pursues us and desires greater and deeper intimacy with us, relating to us in a more profound and deeper way, with others, our community, and with the Mystery that continues to draw us to the place of mercy, generosity, healing, reconciliation, and certainly, love. It’s good that we are given such beautiful images in Scripture on this feast of the Holy Trinity, otherwise we run the risk of trying to figure out three Persons, One God logically, and it just can’t be done. Nor is it really meant to be figured out logically, but rather something we’re called to live into, feel into, and fall into deep within our hearts and souls. So we hear this beautiful image of wisdom a part of creation, breathing life into all around, just as God does into human life at the beginning, finding delight in the human race, as we hear in Proverbs today. In some ways, we have to imagine ourselves in that reading today as God breathes life into each of us, trying to break down the many layers of our lives that become hard to penetrate but only through the breath of God. Wisdom speaks of the presence in the mountains and hills to the depths of the sea. And there we are, climbing the mountains of our challenges and tumbling down the hills. There we are, drowning in the depths of the sea of our own grief as the disciples are in today’s gospel. All along, wisdom and love gradually breaks through taking us deep within our very being, to the depth of God, always inviting and asking, how far into mystery are we willing to fall and to go? There’s the real question of the day for each of us, just how far will we go into this endless mystery. You know, if we’re ever to tackle the problems of our lives and those of the world, we must be willing to far deep within. So often we think it’s about going up and certainly this mystery extends there as well, but deep within, seemingly hidden out of sight, lies something and someone that connects us all, this ever-present mystery. Yet, we’ll continue to try to tackle the problems our society in our own way, this way or that way. The problems of famine, inequality, racism, the problems of poverty and war will never be resolved when we stay locked in the either or of politics. Rather, only when we move to the deeper place and begin to see the other as one with myself and move toward empathy for the human race. Like Proverbs, when we allow ourselves to be taken deeper into mystery the more we find that delight in the human race. Like the disciples, sometimes we’re just not in a place to go to such a place. We are grief-stricken about our past not being the way we think it’s supposed to be. We are still clamoring for power somewhere beyond ourselves, as they were in places of position against the other disciples. We hold on for dear life to what has been never allowing ourselves to be moved to such a deeper place as mystery and oneness with God and humanity. We become stuck in our labels for one another, trying to solve everything logically when in reality, we’re being invited to move to this deeper reality, the deeper mystery we call Trinity. It’s only when they finally encounter something they can’t explain that they’ll begin to be broken open, the experience of the Cross. Crazy enough, it’s as St. Paul tells us today in his letter to the Romans, the more we accept this invitation to go deeper and to grow into mystery, the more we grow in endurance and character because we learn to trust this deeper mystery that is so far beyond us and yet so imminent we can touch it and fall into it and gradually become it. What grace that is for each of us to accept such an invitation, to see beyond our human eyes and begin to see as mystery sees us from the depths of the sea in our souls. As we celebrate this great feast, we’re called to delight in the human race as wisdom does while breathing life into each of us. We’re called to accept the invitation to go deeper into this mystery and ask ourselves how far into mystery we’re willing to go. It’ll change lives and ultimately begin to change the world around us. Sure there are many mountains we’ll continue to climb on our own and we’ll certainly tumble and fall. But with each fall comes an opportunity for new beginning and an invitation to be asked just how far and deep into mystery we’re will to go and to grow. On this Solemnity of the Holy Trinity, we celebrate the fact that it is more than just “a” mystery. Yes, it is that, but also more than that. I dare say it is Mystery. What makes it so difficult is that when we try to understand or think we know what this relation of Father, Son, and Spirit is all about, we immediately fall short of trying to define God, a God who has no lines, but rather is Mystery. From the beginning of creation, and even before the accounts we hear and read in the Book of Genesis, God has desired to give birth to Mystery into this world, to somehow show and model to the people a God who goes beyond all knowledge and understanding. God goes about it in many different ways. Take into account the passage from Exodus today. Before Moses, this God-fearing man, a name is revealed, Lord. From this moment it invites the Israelites to view God in a different way. God is no longer something out there, but is rather Mystery revealed not only out there, but among us, and even more so, within us. For centuries and beyond people will reject this, an impossibility that this God so desires to enter into relationship with people that we could even begin to fathom a name, and yet, over and over, God gives birth in different ways to Mystery. Can our eyes and hearts see what is being revealed? Are we stuck in the need to know and understand, failing to see that somehow God is at play in our lives? I often tell couples I work with who are getting married, as in any relationship, that Mystery is a must. There will never be a moment in our lives when we will fully understand or know the other. No time when we will fully understand ourselves. Certainly, will never begin to know and understand God fully. If we think we do, spiritual death is more imminent, as it so often was for people Israel. As soon as we think we know it all or understand it all, we begin to eliminate Mystery from our lives. This mystery comes to its fulfillment when Mystery enters the world in and through Jesus Christ…for God so loved the world that he gave his only Son. Before the eyes of the disciples, Mystery enters the world and yet they still doubt and question. Before their very eyes, they want to know and understand and box God into who they think God is supposed to be or who they want God to be. They, and at times, we, can’t believe that this God loves us so much that He even tries to give birth to Mystery within us as well. As we celebrate this feast of the Holy Trinity, we pray that our hearts, our minds, our eyes, may be open to Mystery being birthed among and within us, leading us to something new, a surprise in life that will begin to take us to even greater places. We pray for that openness today not just as we celebrate any old mystery, but a God who gives birth to Mystery in the relation of Father, Son, and Spirit, but also in relation among us and as hard as it is sometimes to believe, even within us.